Grab your friends and compete to be The Jubilee Team Challenge Champions! A celebration of Rainier Beer with live music at the Old Rainier Brewery on Saturday, October 21st from 5-11PM. Main stage programmed by KEXP with My Goodness, Bread & Butter, and Naked Giantas Inflatable Obstacle Course on site, the Jubilee Team Challenge and of course plenty of Rainier Beer. 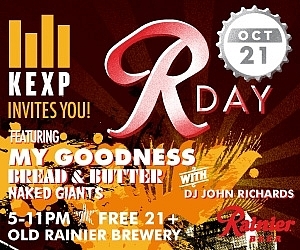 Great Music programmed by KEXP, Fun Games, Free Inflatable Obstacle Course, Food and of course Rainier Beer! What is the Jubilee Team Challenge? The Jubilee Team Challenge is a fun and friendly competition for 20 teams of 4 that includes Flip Cup, Giant Jenga, Stein Holding Contest and a 50 foot Inflatable Obstacle Course! Are you and 3 friends up to the challenge? Leading up to R Day some of our favorite places around town will host R Day pre-parties with live music, fun games and a chance to register your team for the Jubilee Team Challenge taking place on R Day. Look out for these parties taking place around town! Parking: Safeco Field Parking Garage, 337 Edgar Martinez Dr S, Seattle, WA 98134 - **There is no parking at the event site.